elderly widow whose rented home had been inundated as a result of the landfall of Hurricane Harvey along the Texas Gulf Coast on Aug. 17. Harvey is the wettest tropical hurricane to ever hit in the contiguous United States, dumping more than 40 inches of rain over a four-day period with a peak accumulation of 51.88 inches in some areas. A least 83 confirmed deaths; one in Guyana and 82 in the United States, have been attributed to the storm. Economic losses are estimated at up to $200 billion, with a large portion sustained by uninsured homeowners. On his rounds, the postal carrier came to the home of “Ms. Kelly.” He heard weeping and found her standing in water in the backyard of her residence. She told him she had waded through waist-high water in the house for more than two days. 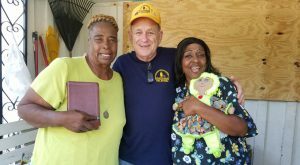 The carrier told Ms. Kelly he knew where she could get some help, and he put in a call to the Oklahoma Southern Baptist Disaster Relief operation headquartered at Spring, Texas, First. was accompanied by trained assessor Christi Capshaw, a member of Dennnison, Texas, Parkside, to visit the distraught widow. Capshaw and Sparks ministered to the Jonesboro, La. native and began the process of getting her home cleaned out. They also made arrangement to have new furniture donated by a local company delivered when the clean-up is finished. The next day, they returned and prayed again with Ms. Kelly. Sparks gave her a new Bible and some cash which had been raised by a Sunday School class at Lawton, First, East.